The Info Center is now listed on AppExchange. Feel free to leave me a review on the listing. If you are a developer, the Info Center would be a good reference for s-Control development using the AJAX toolkit. The reason I went and created this application in the first place was to teach myself how to develop s-Controls using the AJAX toolkit. 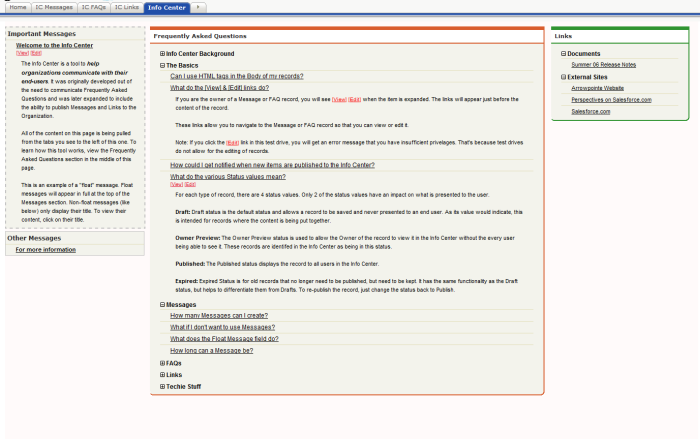 I needed a purpose otherwise I’d never really learn it, so I came up with the Info Center.